Italian President Silvio Berlusconi & Colonel Muammar Gaddafi. This is very much a work in progress and I am looking for critical suggestions, especially from people with direct experiences. On February 22, Muammar Gaddafi was boasting on state TV that the Libyan people were with him and that he was the Libyan revolution, even while his dwindling army of special guards and hired mercenaries attempted to drown a popular revolution in blood. Civilians were strafed and bombed from helicopters and planes. Snipers with high-powered rifles fired into unarmed crowds. Two pilots flew their fighter jets to Malta rather than bomb their own people and another two are reported to have crashed their jets rather than attack civilians. Sections of the armed forces, several diplomats and a couple of ministers abandoned the regime and at the time of the writing the east of Libya was in the hands of popular revolutionary committees. And as more sections of his armed forces stared to go over to the people, he ordered troops who refused to shoot their own people to be executed. Gruesome footage of the carnage was revealed to the world despite the Gaddafi regime’s desperate attempts to seal the country by blocking the internet and locking out journalists. First Gaddafi’s son Saif al Islam (a darling of greedy US and European corporations in recent years) and then Gaddafi himself tried to deny these massacres while simultaneously threatening the Libyan people to carry out ruthless retribution against those who dared to rise up against the regime. While the regime’s genocide against the Libyan people unfolded, it took days before the US and other Western governments were prepared to condemn the regime for this monstrosity. Even as late as February 23, Barak Obama had not condemned Gaddafi by name. Yet in the 1980s and most of the 1990s, the Gaddafi regime was attacked by the same western governments as a “terrorist rogue state” because of its political and material support to numerous national liberation movements around the world. The Reagan administration imposed economic sanctions on Libya and carried out bombing raids to try and assassinate Gaddafi. In 1987, I visited Libya as a journalist for the left-wing newspaper Direct Action and visited Gaddafi’s bombed out home. I wrote several articles describing and defending the Libyan revolution. However, in the late 1990s secret negotiations for a rapprochement with the US and other Western governments began. First the UN sanctions were lifted in 1999 and by 2006 the US lifted its own sanctions and normalised relations. European leaders flocked to Libya with greedy businessmen hanging on to their coat tails and before long several European oil companies were back in business, with banks, airlines and hotel chains following. Former British Labour PM Tony Blair and scandal-plagued, right-wing Italian President Silvio Berlusconi played leading roles in the process. Gaddafi’s son Saif was the the neo-liberal frontman for Libya. He offered greater access to capital, tax concessions and privatisation. According to an April 2010 report from the Libyan government, over the previous 10 years the the regime privatised 110 state-owned companies. The same report promised to privatise 100% of the Libyan economy over time. The prospect of the privatisation of the refineries and other downstream sectors of the oil industry promises lucrative profits. Worried that they were missing out to European competition, a group of powerful US companies (including BP, Chevron, ConocoPhillips, Dow Chemical, ExxonMobil, Fluor, Halliburton, Hess Corporation, Marathon Oil, Midrex Technologies, Motorola, Northrop Grumman, Occidental Petroleum, Raytheon, Shell and United Gulf Construction Company) set up a US-Libya Business Association to catch up. Among the Gaddafi regime’s new lobbyists in Washington was arch-neocon Richard Perle, a former Reagan-era US Defense Department official and George W. Bush-era chairman of the US Defense Policy Board. However, 80-85% of Libya’s oil exports go to Europe and companies such as British Petroleum, Italy’s Eni, Spain’s Repsol, Royal Dutch Shell, have some of the biggest stakes. 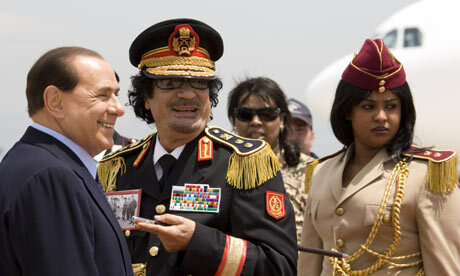 “Gaddafi and Berlusconi have a famously warm personal relationship. Less well-known, however, is the fact that Berlusconi is in business with one of the Libyan state’s investment vehicles. “In June 2009, a Dutch-registered firm controlled by the Libyan Arab Foreign Investment Company, took a 10% stake in Quinta Communications, a Paris-based film production and distribution company. Quinta Communications was founded back in 1990 by Berlusconi in partnership with Tarak Ben Ammar, the nephew of the late Tunisian leader, Habib Bourguiba. “The Italian prime minister has a 22% interest in the company through a Luxembourg-registered subsidiary of Fininvest, the firm at the heart of his sprawling business empire. Last September, the Libyans put a director on the board of Quinta Communications to sit alongside Berlusconiís representatives. “Libyan investors already hold significant interests in several strategic Italian enterprises. They reportedly own around one per cent of Italy’s biggest oil company, Eni; the LIA has an acknowledged 2% interest in the aerospace and defence group, Finmeccanica; Lafico is thought to retain more than 2% of Fiat and almost 15% of a quoted telecommunications company, Retelit. “About 150 British companies have established a presence in Libya since the US and Europe lifted economic sanctions in 2004, after the country renounced terrorism, ceased its nuclear weapons programme and handed over two suspects in the Lockerbie bombing case. “The most high profile have been the oil companies, keen to tap Libya’s vast reserves of fossil fuels. In a deal brokered in 2007 by Tony Blair, BP signed a £560m exploration agreement allowing it to search for oil and gas, offshore and onshore, in a joint venture with the Libya Investment Corporation. Shell is also exploring for oil in Libya as western companies seek to capitalise on a country with the largest oil reserves in Africa and substantial supplies of gas. “High street retailers such as Marks & Spencer, Next, Monsoon and Accessorize have also set up in the country to serve the growing middle-class population, as oil revenues have “trickled down” into the broader Libyan population. “Companies such as AMEC, an engineering firm, and Biwater, a waste treatment company, have supplied services to Libya, which is using its oil revenues to reshape the country through an infrastructure spending spree that will cost about £310bn over the next decade. “Tony Blair has an excellent relationship with my father. Libya considered Blair to be a trusted adviser to the Libyan Investment Authority, a role that Blair now denies. ‎”Since the warming of relations between Libya and Britain, officers travelled frequently to Tripoli between 2008 and 2009 to train police, and Britain has authorised the export of tear gas, crowd-control ammunition, small-arms ammunition and door-breaching projectile launchers. One of the murderous special battalions headed by another Gaddafi son, Khamis, is a British-trained unit, according to a February 21 Associated Press report. Blair and Gaddafi doing their infamous 'deal in the desert' in 2007, which involved British training and advising Libyan special forces. “Libya is the richest North African country… But that does not reflect the real economy of the average Libyan, with around half the population falling outside the oil-driven economy. The unemployment rate is at a surprising 30%, with youth unemployment estimated at between 40% and 50%t. This is the highest in North Africa. “Also other development indicators reveal that little of the petrodollars have been invested in the welfare of Libya’s 6.5 million inhabitants. Education levels are lower than in neighbouring Tunisia, which has little oil, and a surprising 20% of Libyans remain illiterate. “Decent housing is unavailable to most of the disadvantaged half of the population. A generally high price level in Libya puts even more strains on these households. “But the key of popular discontent is the lack of work opportunities, which strongly contrasts the Libyan image of a rich nation constantly propagated by the regime and its Soviet-style media. The oil sector employs only 4900 Libyans with a further 1000 training overseas, according to an October 2010 report by Libyan National Oil Company (NOC). In the 1980s, the Gaddafi regime came under attack from the Reagan administration because it took a strong anti-imperialist line and gave financial and material aid to many national liberation movements at the time. There were also some wierd right-wing sects seeking and sometimes obtaining Libyan largesse and the Gaddafi regime meddled disastrously and sometimes bloodily in factional disputes within the Palestinian liberation movement. The Gaddafi regime also claims to have provided its citizens with free education and health, though quality and access was not even. Tellingly, Libyans, who could afford it, have preferred to go to neighbouring Tunisia (which is not an oil-rich state) or to Europe for serious medical treatment. It provided its workers with some welfare but did not allow unions and it certainly it did not treat its significant number of “guest” workers equally or fairly. There were closed of labour camps for some of these workers from other countries and trade unions were not allowed. A bizarre personality cult around Gaddafi was obvious and while there was a pretence at popular democracy of sorts through a system of “people’s congresses” these only had a nominal existence. Left commentator Tariq Ali dismissed the Gaddafi-led 1969 revolution as “all for show, like his ghosted science-fiction short stories”. But there was a political revolution in 1969 that did result in the nationalisation of the Libyan oil industry and some broader redistribution of oil wealth contrasted sharply with that in countries like Saudi Arabia. This was a nationalist revolution, which similar to that led by Nasser in Egypt, also called itself “socialist”. The US and other imperialist governments at the time saw this as an attack on their presumed right to exploit Libya’s oil resources. “By 1969, the US and British air bases in Libya were of declining strategic importance, but Tripoli had become a producer of energy vital to the economies of our West European allies and profitable for American companies. While the US still enjoyed a cozy relationship with an aging monarch and his sclerotic political system, Libyan popular attitudes were not isolated from the rest of the Arab world. The war of June 1967 had left Arabs everywhere with a feeling of humiliation and a conviction that Washington had aided Israel’s victory, achieved in large part by its devastating surprise attack on the Egyptian Air Force. This set the stage for the Libyan Revolution of September 1, 1969. According to Henry Kissinger’s memoirs, the Nixon government had prepared a covert program to assassinate Gaddafi and other Libyans, who had led the1969 revolution against a corrupt monarchy, but this was abandoned because big oil companies like Exxon and Mobil prefered to cut a deal with the regime, albeit on tougher terms. “Structural reforms in other areas have progressed. The passing in early 2010 of a number of far- reaching laws bodes well for fostering private sector development and attracting foreign direct investment… A comprehensive civil service reform is needed to facilitate more effective [read lower and stricter] wage and employment policies that would address the needs of a young and growing labor force. The IMF will have to eat that prediction. The stifling political repression (which has been fiercest in the eastern part of the country, which is also the poorest), the corruption, nepotism and flamboyant lifestyles enjoyed overseas by Gaddafi’s children have proved too much. And the stirring example of the youth of Tunisia, Egypt, Bahrain, Algeria, Yemen, Syria, Jordan and Djibouti added the spark. What has led to this new Libyan revolution is the degeneration of the regime born of the 1969 revolution into a crony capitalism. The popular character of the new revolution is undeniable, it is far from clear what sort of regime will emerge out of it. The same greedy and powerful Western interests that first attacked and then propped up the Gaddafi regime are preparing for a change of tack, including considering direct military intervention. Hopefully the makers of the new Libyan revolution will heed the lessons of its own history. Peter, This is very useful. It outlines the political shift of the Libyan regime in the last two decades, of which the 1990’s seems to have been pivotal. When I visited Libya in the late 1980’s, we then assessed the anti-imperialist character of the regime and the need to highlight this against the tide of imperialist propaganda. Then, we also noted that the overall direction was still unclear — the ‘third way’ of Gaddafi’s ‘green’ philosophy — but the more equitable gains of the 1969 revolution were apparent, including on the women’s question. At the time the regime was pushing back, through a real propaganda battle, the conservative Muslim clergy on the women’s question, including the right to abortion. This was also a plus for me at the time. The ‘circle’ spirit of ‘popular power’ was not very convincing then and it certainly was not the same as the Cuban revolution. Again, thanks for this assessment and it has been distributed amongst various e-lists here, in the Philippines. How we can enter Sri Lanka in to above list. A story I heard from my uncle 10 years ago, and repeated many times since, is that when he was in training in Communications Taining School in US, as a Turkish Army Officer on Fort Meade, or Fort Dix, in 1966, or 1967, Qaddafi was one of the officers also training there from Libya. My uncle had commented then, that Qaddafi was particularly nasty, arrogant and somewhat crazy and always had a small cadre of followers around him. Is there any other colloboration to this fact, before I further question my uncle about the particulars? I would like to be of help. I haven’t heard of that before but Wikipedia says “Gaddafi entered the Libyan military academy at Benghazi in 1961 and, along with most of his colleagues from the Revolutionary Command Council, graduated in the 1965–66 period. After receiving his commission, he was selected for several months of further training at the Royal Military Academy Sandhurst, England.” No mention of training in US. Please add Syria to the poster. Informationsstelle Militarisierung (IMI) » Blog Archiv » Libyen: Intervention im Namen des Volkes?